Metastatic pancreatic cancer — cancer that has spread from the pancreas to other tissues and is responsible for most patient deaths — changes its metabolism and is “reprogrammed” for optimal malignancy, according to new findings reported Jan. 16 in Nature Genetics. It may be possible to reverse the malignant reprogramming to treat metastatic pancreatic cancer, said Oliver McDonald, M.D., Ph.D., assistant professor of Pathology, Microbiology and Immunology at Vanderbilt, and lead author of the study. 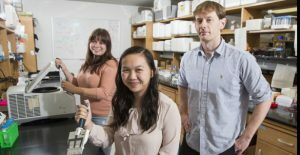 The researchers have identified a compound that reverses the reprogramming and prevents tumor formation in model systems. McDonald and close collaborators from Memorial Sloan Kettering Cancer Center and Johns Hopkins University School of Medicine sought to understand how pancreatic cancer progresses from a primary tumor in the pancreas to metastatic disease in distant tissues. The prevailing theory of cancer progression — that it’s driven by the accumulation of genetic mutations that increase tumorigenic “fitness” — holds true for the early stages of cancer progression, but metastases seem to find new ways to increase their fitness, McDonald said. “Intensive DNA sequencing efforts to find the genetic ‘drivers’ of metastasis, which is what kills patients in up to 80 percent of cases, have thus far been disappointing, to say the least,” he said. Instead of looking for genetic changes during cancer progression, McDonald and his colleagues examined epigenetics — modifications of chromosomal DNA and proteins that control gene function. “Epigenetics can be thought of as the software that programs function into the DNA hardware,” McDonald said. The researchers studied a unique set of matched primary and metastatic pancreatic cancer samples collected (by rapid autopsy) from patients who died from aggressive, widely metastatic disease. Christine Iacobuzio-Donahue, M.D., Ph.D., now at Memorial Sloan Kettering, began collecting the patient samples and studying the primary and metastatic tumors when she was a faculty member at Johns Hopkins. She and her colleagues sequenced genomic DNA in the tumor samples but did not find any new driver gene mutations in the metastatic samples compared to the primary tumor samples, said McDonald, who completed clinical training under Iacobuzio-Donahue at Johns Hopkins. After moving to Vanderbilt, McDonald continued working with Iacobuzio-Donahue and Andrew Feinberg, M.D., MPH, who is also at Johns Hopkins and is a recognized pioneer in the field of cancer epigenetics. “It was an incredibly productive collaboration that brought together Chris’s genetics expertise and amazing patient samples, Andy’s expertise and world-class sequencing facilities, and our experimental work and data analysis at Vanderbilt,” McDonald said. The researchers were surprised to find massive epigenetic changes across the genome of distant metastases (those resulting from spread of cancer cells through the bloodstream), compared to matched primary tumor cells and peritoneal “carcinomatosis,” a localized form of intra-abdominal metastasis that is not thought to spread through the bloodstream. To further explore the reprogramming, McDonald performed metabolic studies on the samples, with collaborators at Duke University. By painstakingly analyzing long lists of metabolites, McDonald and Vanderbilt undergraduate student Anna Word discovered that distant metastases altered their metabolism by consuming excess amounts of glucose and directing it through the pentose phosphate metabolic pathway. A particular enzyme in the pathway — phosphogluconate dehydrogenase (PGD) – turned out to be key, enabling the conversion of glucose to metabolites that “can directly fuel tumor growth,” McDonald said. The researchers demonstrated that blocking the PGD enzyme genetically or with a pharmacologic inhibitor reversed the epigenetic reprogramming and malignant gene expression changes detected in distant metastases, and also strongly inhibited their tumor-forming capacity, with no effect on normal cells or peritoneal pancreatic cancer controls. Kimberly Stauffer, a graduate student at Vanderbilt, played an important role in uncovering the inhibitor effects. The findings may help explain a clinical enigma — the observation that metastatic tumors often seem to progress very rapidly compared to primary tumors. The current research suggests that pancreatic cancer cells that spread to organs that receive a blood supply rich in glucose and other nutrients, such as the liver and lungs, acquire metabolic adaptations to use these “natural resources” to increase their tumorigenic fitness. McDonald is working with medicinal chemists at Vanderbilt to develop more selective and potent PGD inhibitors for testing in animal models, with the ultimate goal of moving these inhibitors into clinical trials for pancreatic cancer patients. This research was supported by grants from the National Institutes of Health (CA038548, CA140599, CA179991, CA180682), and by the AACR Pancreatic Cancer Action Network, Vanderbilt GI SPORE and Vanderbilt-Ingram Cancer Center.